First let me start by saying that these cards are not mine, and are not for trade. My uncle is probably going to be selling them through an estate sale for a good friend of his that has just passed away. He found a whole bunch of baseball cards at the house and brought some to show me. There were 2 of the same 1952 Bowman in a box, one is in great condition, the other one... not so much. He had wanted to have them graded, or at least the one and I had advised him against it until I could write this post showing the blogosphere the cards figuring perhaps someone might want to buy it ungraded as a result of most people not being fans of BGS and PSA/DNA. These are the pictures of the cards, the one in the case can be scanned without for anyone sincerely interested. Honestly, I just wanted to showcase these cards because it is not everyday any of us stumble upon cards like this. I would like to try and finagle the one in bad shape for my own collection. 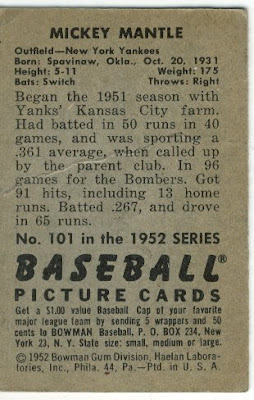 There were many other 1951 and 1952 Bowman found though I am not sure what is going to be done with those. If there are any vintage collectors interested in knowing who I have here please let me know. They are in good condition, nothing will grade for higher than a 5 or 6 if even that (just as a point of reference). I also have some cards that I can't identify right now that I will probably put up later tonight if time permits so that maybe you guys can help figure out what they are if I can't (by can't I mean too lazy to look). Anyway, enjoy the look at them because I sure am. Sweet cards, even if you aren't a Yankees fan. I am officially jealous. I've never even held one of those Mantle cards. 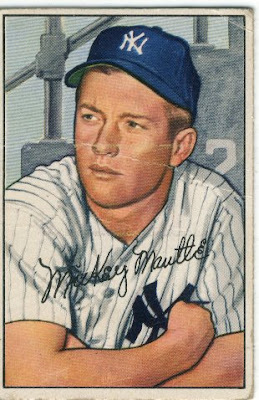 Amazing, a real life 52 Mantle card. Even if it isn't the famous Topps variety it's still impressive. It's hard to say if you should grade it. Usually if it was EX+ or better grading is the best way to go to maximize price. In your case the nicer one is a diamond cut with soft corners so it might get punished by the grading companies. If he has a bunch of vintage cards he might consider contacting a few of the bigger reputable auction houses for their opinion. Wow, look at that old-school signature on the front. Must be before he changed to the tradmark curly "M's." While there are lots of people who aren't a fan of grading modern cards (myself included), I would err on the side of always having nice vintage graded. The extra degree of authenticity never hurts a sale, and a low number grade doesn't hurt a vintage card with good eye appeal as much as it does a modern card. BGS is king for modern, but PSA or SGC are go-to for older stuff. Any money spent getting them slabbed will probably be recouped with a higher ending price due to the increased provenance. I'm also jealous. Those Bowmans are great cards! WOW! Must be truly awesome to hold one of those things. that is a beauty! i wish it was mine! I would be interesed in the other cards. 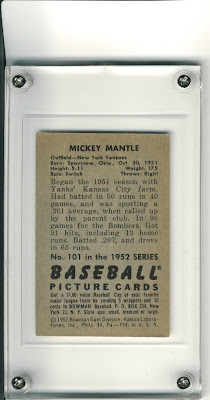 My 50s Bowman want list is here http://thoughtsandsox.blogspot.com/search/label/1940-1959%20Red%20Sox%20Want%20List or e-mail me the card numbers and I will lookk them up. OK, so here is the update. I was watching the Yankee game with my grandmother so I haven't had a chance to post a response. She was coaching from the couch since Girardi's ejection in the 3rd inning so it was very entertaining. She was also happy that Leo Mazzone is no longer in the Braves bullpen because he makes her crazy rocking back and forth. Anyway, I told my uncle we should grade the card and he said ok. 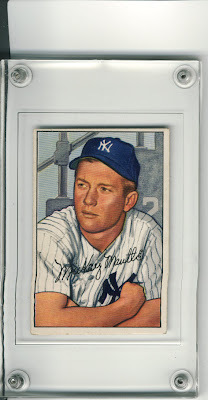 He was going to sell the other Mickey Mantle at the house so I asked if I could keep it since it is not in good shape. He offered to give me the nice one and I said no, because I don't really need something like that. He said we would see what it grades for and then I can decide. He understands full well how rare it is to find a card like this in such good condition so we will have it graded at the White Plains show in August and go from there. This is what happens when I am operating on about 4 hours sleep. Brain function is very minimal. Selling such a classic card like that privately, grading is a must to get the most out of it.. BVG is BGS for vintage cards, and is probably the most credible grade since they're so tough - but I'd personally go with PSA, as you may get an extra 0.5 point or so.. Those are the only 2 places I'd deal with tho.. I'd love to estimate what it would grade out as, but it'd just be a total guess, lol.. The other big hits in the '52 Bowman set are - Mays, Musial, and Berra.. The Berra is card #1, so finding it in good shape is alot tougher than other cards in the set.. Must be so cool to actually see and hold these cards personally - good luck!